Who killed one of the guests of the Angkatells? Could it be the wife, the lover, the former governor, the romantic rival, the cousin, the butler, the maid, Miss Lucy or the girl next door? This Agatha Christie conundrum unfolds in “The Hollow” on stage at Whidbey Playhouse in Oak Harbor April 13-29. But this whodunit is set stateside and not in the countryside of the mystery author’s native England. Besides, British accents are hard to get right, Meyers added. 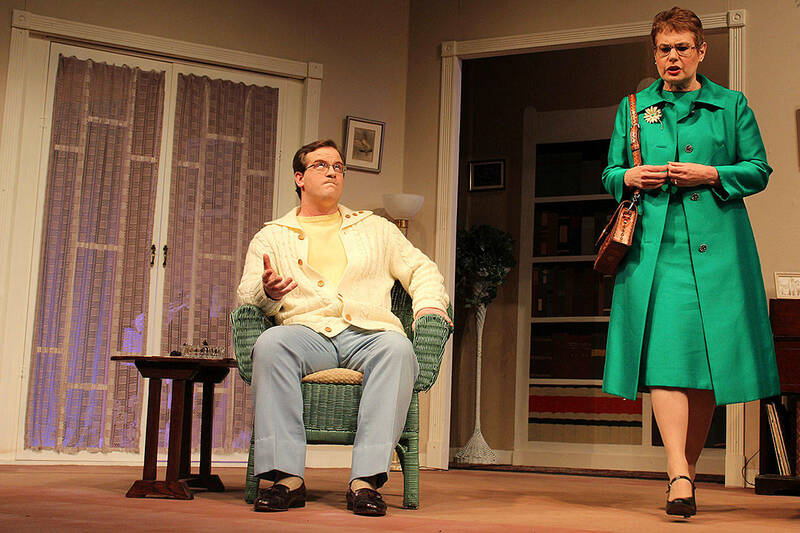 In this version of The Hollow,” Jack McPherson as Col. Henry Angkatell, and Ingrid Schwalbe as his wife, Miss Lucy Angkatell, are the former governor and first lady of Virginia. They frequently invite relatives and friends from afar to spend the weekend and indulge them with formal dinners, servants and sports of the leisure class, like target practice. McPherson, whose first acting role was in 1936 when he was six, is charming as the genteel Southern gentleman who is forever crawling out of the rabbit holes of conversations with his wife. Schwalbe plays ditsy but she is not to be denied. With verve and voice, she steals the show with her larger than life presence. “She is a spark plug,” director Meyer said. Which is actually an understatement. Schwalbe has acted professionally and semi-professionally around the country and in Europe. She enjoys performing in a murder mystery, she said, because of the extra dash of acting required. Tara Hizon, a familiar Whidbey Playhouse face who first appeared on its stage 25 years ago, plays Henrietta Angkatell, a famous sculptor and a woman with a secret. Lisa Judd deftly plays the role of Gertie Cristow, the devoted and rather dull wife of Dr. John Cristow, played by David Penrod. Judd is also assistant director and Ken Grigsby is producer. Penrod is performing at the Playhouse for the first time and returning to his young passion of acting after serving in the Army for 13 years. “It’s been very intriguing to be back on stage and remembering all of the subtle nuances to a performance,” Penrod said. “There’s so many little things to remember. Making his theater debut is David Gibbs, in the Navy in real life and plays Detective Sgt. Penny on stage. He’s paired with Detective Calhoun, played by Ben Honeycutt, last seen as Ebenezer Scrooge in the Playhouse Christmas production. Playing a chatty maid who’s new to the role of domestic help is Desirae Bradley. Also in a Whidbey Playhouse production for the first time, Bradley is the light ying to the dark yang of long-time butler Gudgeon, played by David Frazer. The youngster in the 12-member cast is Oak Harbor High School student Trinity Slowik, who got her acting chops with The Would Be Players, the group for younger folk wanting to learn theater. Warren Rogers is also a Would Be Players alum, now in his first year at Skagit Valley College. Warren plays the young cousin, Edward Angkatell, heir to the family’s country estate, a place no one else seems to want to visit although they talk about it endlessly. The one true outsider to the family gathering is actress Shawna Wilson who plays a famous actress named Veronica Craye. But when the book was bound for the stage, Christie decided to keep the story focused on the family and cut the famous sleuth from the script, Meyer explained. So Hercule Poirot isn’t going to catch the killer this time. But someone is going to trip on their own trap. Lisa Judd deftly plays the role of Gertie Cristow, the devoted and rather dull wife of Dr. John Cristow, played by David Penrod, returning to the stage after serving in the Army. It’s a mystery who killed one of the guests at the Angkatell home. Could it be the wife, the lover, the old friend, the former governor, the romantic rival, the butler, the maid, Miss Lucy or the girl next door? Detective Calhoun, played by Ben Honeycutt, is determined to find out. Is it an unconventional marriage proposal? Or perhaps something else causes Trinity Slowik (Midge Harvey) to kneel beside Warren Rogers (Edward Angkatell) near the end of the play, “The Hollow,” at Whidbey Playhouse April 13-29.